Home › Pools › Is Chlorine the Right Chemical Program for You? Is Chlorine the Right Chemical Program for You? Whether you are a pool pro or just a beginner, knowing all the information about pool chemicals will help you make the right choices when it comes to deciding which chemical program you want to use. This series will focus on the 4 different programs offered by BioGuard to help you determine which is the best fit for you. We’re going to start with the most common: chlorine. I promise you, it’s as easy as 1-2-3. BioGuard tries to make caring for your pool as simple as possible so Step 1 in their 3-step chlorine system is to Sanitize. Chlorine is your sanitizer, which is what kills bacteria and controls algae in your pool. 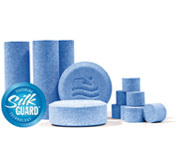 One of the best things about BioGuard chlorine is the SilkGuard Advantage. It not only sanitizes your water but it also protects your pool equipment, prevents staining and scale buildup, and best of all is that it makes the water feel like silk. There are several options when it comes to which type of chlorine/sanitizer is best for you. Silk Smart Sticks: If you’re looking for a low-maintenance option, this is for you. Smart Sticks only dissolve when your pump is running, so in order for these to work properly, you need to run your filter at least 8 hours per day. (There’s no such thing as over-filtering your pool so this is the minimum recommended amount.) You just add one stick into the skimmer each week and let them do the rest. Silk Tabs and Silk Sticks: These are also slow-dissolving but will dissolve continuously, whether or not the pump is on. They also contain SunShield Technology to prevent the sun from burning the chlorine out of the water. Super Soluble: This is a powder form of chlorine that dissolves quickly, leaving no residue in the water. You would just add a little bit each day, depending on the size of your pool. This is great for small pools because you can measure out the perfect amount without over-chlorinating your water. Smart Shock: This is the best maintenance shock to use. It’s an oxidizer and a clarifier in one. There’s no need to pre-dissolve it and you can swim just 15 minutes after adding it to the water. 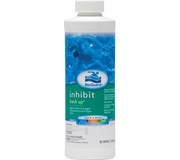 It helps keep the water sparkling and fights off any bacteria or algae. Burn Out: If you’re dealing with a green or cloudy pool, other alternatives are Burn Out 35 or Burn Out 3 for really stubborn chlorine blocks. These will really get rid of any contaminants in the water. It’s shocking how well they work! Step 3 in the Weekly Program: Preventative Algaecide. Back Up: There are many different algaecides on the market but we recommend using Back Up. It’s a preventative algaecide and is highly effective when it comes to blocking a wide variety of algae growth in pools of all sizes. 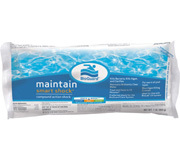 It’s non-staining and won’t affect any of your other chemical levels in the water. If you prefer this explanation in video form…here you go!